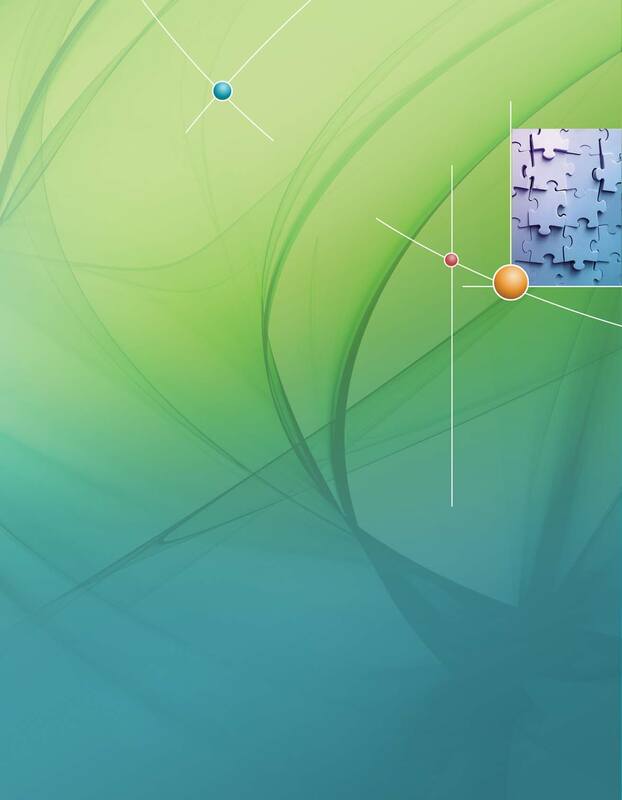 Download "Shared Solutions. A Guide to Preventing and Resolving Conflicts. Regarding Programs and Services for Students. 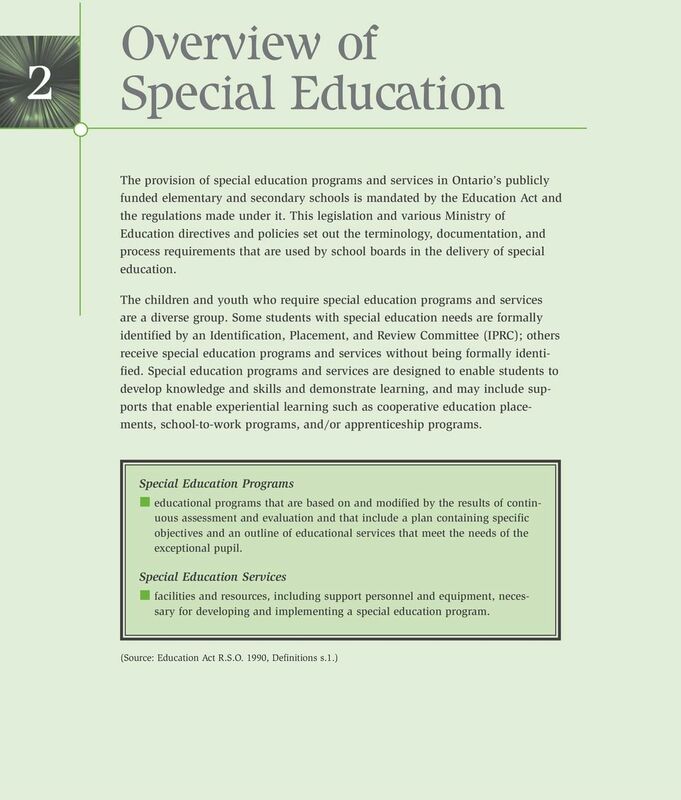 With Special Education Needs"
7 Introduction 1 The Ministry of Education continues to encourage the use of approaches and strategies that lead to higher achievement for all students in Ontario s publicly funded education system. This resource guide is intended to help parents, 1 educators, 2 and students with special education needs work together to prevent conflicts, resolve them quickly, and allow students to develop their full potential and succeed in school. 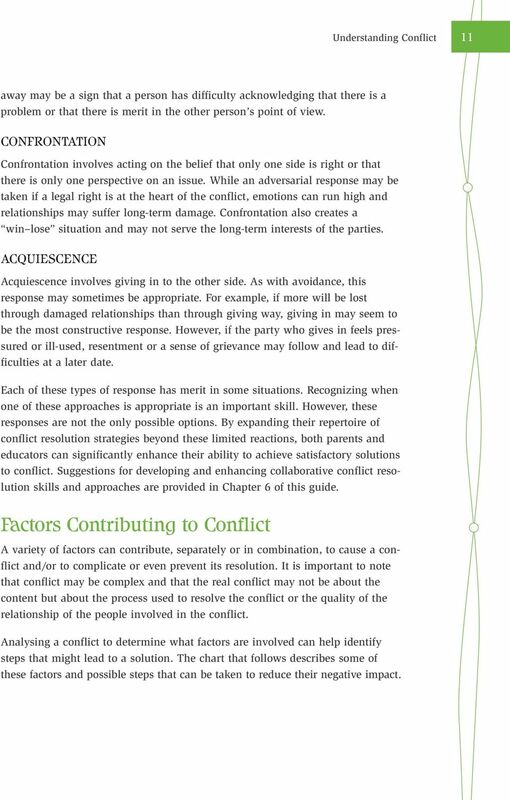 The approaches outlined build on techniques and strategies for conflict prevention and resolution that are already in place in many school boards. There are many ways of working through conflict, ranging from informal to formal methods. 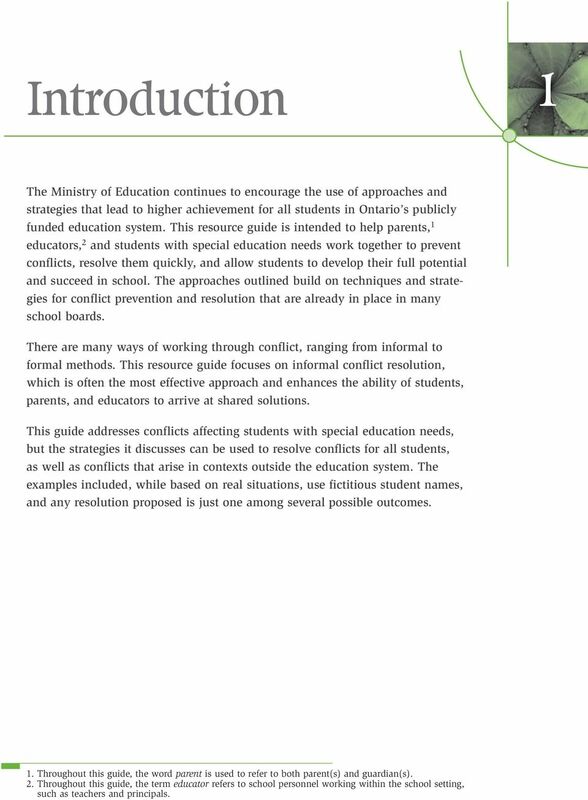 This resource guide focuses on informal conflict resolution, which is often the most effective approach and enhances the ability of students, parents, and educators to arrive at shared solutions. 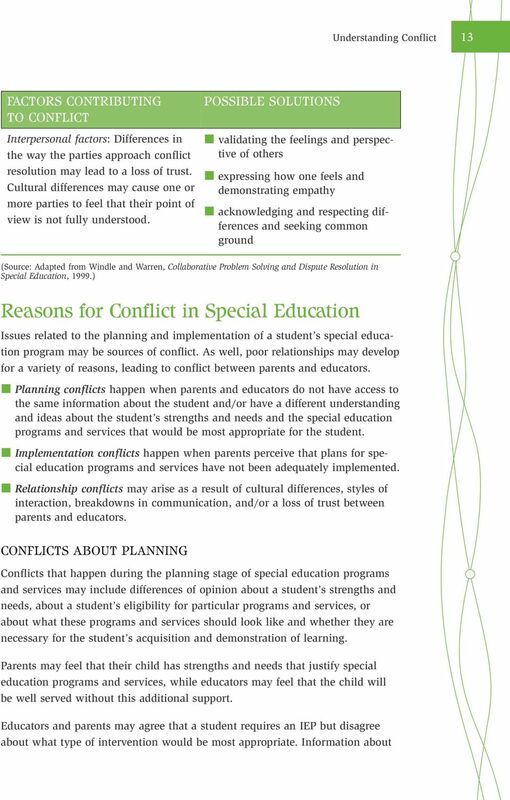 This guide addresses conflicts affecting students with special education needs, but the strategies it discusses can be used to resolve conflicts for all students, as well as conflicts that arise in contexts outside the education system. The examples included, while based on real situations, use fictitious student names, and any resolution proposed is just one among several possible outcomes. 1. Throughout this guide, the word parent is used to refer to both parent(s) and guardian(s). 2. Throughout this guide, the term educator refers to school personnel working within the school setting, such as teachers and principals. 9 Overview of Special Education 7 Students with special education needs may require accommodations and/or modifications to the Ontario curriculum, and/or programs or courses with alternative expectations, or a combination of the three. 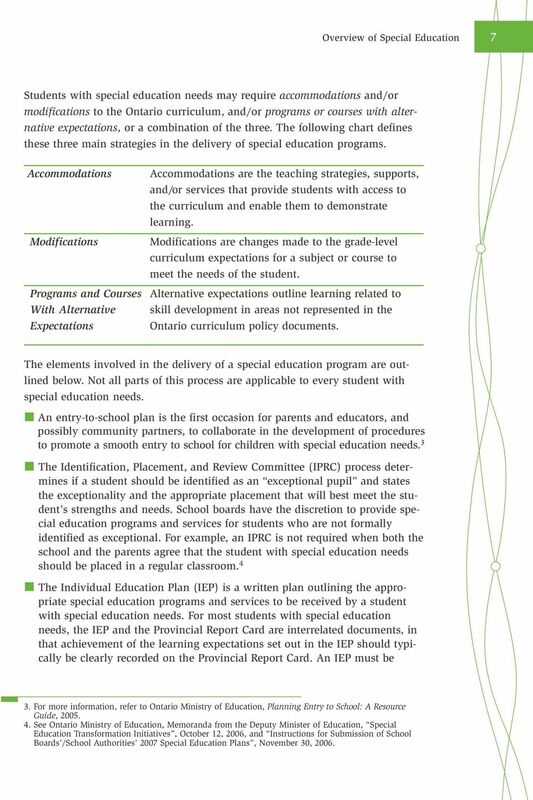 The following chart defines these three main strategies in the delivery of special education programs. Accommodations Modifications Programs and Courses With Alternative Expectations Accommodations are the teaching strategies, supports, and/or services that provide students with access to the curriculum and enable them to demonstrate learning. Modifications are changes made to the grade-level curriculum expectations for a subject or course to meet the needs of the student. Alternative expectations outline learning related to skill development in areas not represented in the Ontario curriculum policy documents. The elements involved in the delivery of a special education program are outlined below. Not all parts of this process are applicable to every student with special education needs. An entry-to-school plan is the first occasion for parents and educators, and possibly community partners, to collaborate in the development of procedures to promote a smooth entry to school for children with special education needs. 3 The Identification, Placement, and Review Committee (IPRC) process determines if a student should be identified as an exceptional pupil and states the exceptionality and the appropriate placement that will best meet the student s strengths and needs. School boards have the discretion to provide special education programs and services for students who are not formally identified as exceptional. For example, an IPRC is not required when both the school and the parents agree that the student with special education needs should be placed in a regular classroom. 4 The Individual Education Plan (IEP) is a written plan outlining the appropriate special education programs and services to be received by a student with special education needs. For most students with special education needs, the IEP and the Provincial Report Card are interrelated documents, in that achievement of the learning expectations set out in the IEP should typically be clearly recorded on the Provincial Report Card. An IEP must be 3. For more information, refer to Ontario Ministry of Education, Planning Entry to School: A Resource Guide, See Ontario Ministry of Education, Memoranda from the Deputy Minister of Education, Special Education Transformation Initiatives, October 12, 2006, and Instructions for Submission of School Boards /School Authorities 2007 Special Education Plans, November 30, 2006. 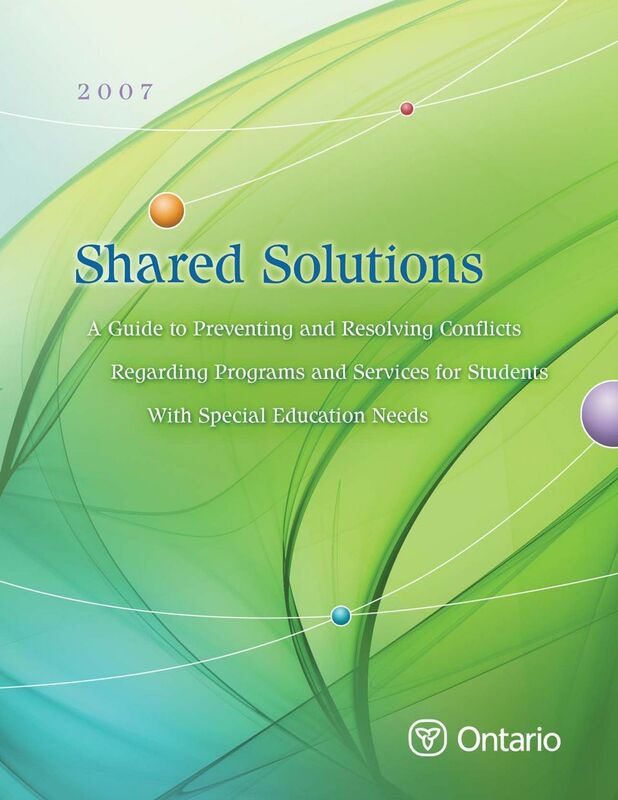 10 8 Shared Solutions 2007 developed for students who are formally identified as exceptional and may be developed for students who are not formally identified as exceptional. Parents must be consulted in the development of the IEP. 5 Experience has shown that educators and parents who work together in the development of the IEP share a common understanding that reduces potential future conflict. The transition plan is another important component of a student s special education program. It helps the student with special education needs make a successful transition from school to further education, work, and community living. The transition plan is a required part of the IEP for students fourteen years of age and older, unless the student is solely identified as gifted. 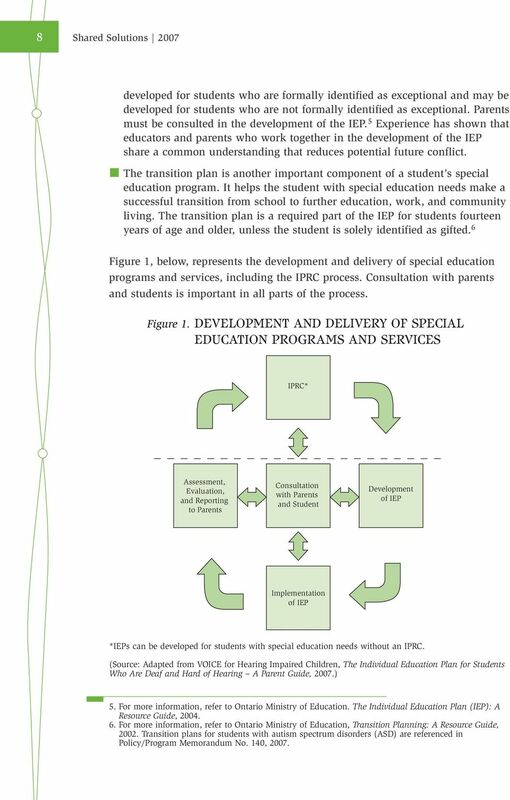 6 Figure 1, below, represents the development and delivery of special education programs and services, including the IPRC process. Consultation with parents and students is important in all parts of the process. Figure 1. DEVELOPMENT AND DELIVERY OF SPECIAL EDUCATION PROGRAMS AND SERVICES IPRC* Assessment, Evaluation, and Reporting to Parents Consultation with Parents and Student Development of IEP Implementation of IEP *IEPs can be developed for students with special education needs without an IPRC. (Source: Adapted from VOICE for Hearing Impaired Children, The Individual Education Plan for Students Who Are Deaf and Hard of Hearing A Parent Guide, 2007.) 5. For more information, refer to Ontario Ministry of Education. The Individual Education Plan (IEP): A Resource Guide, For more information, refer to Ontario Ministry of Education, Transition Planning: A Resource Guide, Transition plans for students with autism spectrum disorders (ASD) are referenced in Policy/Program Memorandum No. 140, 2007. 11 Overview of Special Education 9 In Ontario, the Ontario Human Rights Code provides for the right to equal treatment with respect to services, without discrimination on the basis of a number of grounds, including disability. Education is considered to be a service under the code, and service providers have an obligation to accommodate the strengths and needs of a person with a disability, unless doing so causes "undue hardship for the provider, considering cost, outside sources of funding, if any, and health and safety requirements, if any. 7 Persons with disabilities are to have their strengths and needs considered, assessed, and accommodated on an individual basis. This includes students with special education needs, whether or not they have been formally identified as exceptional. Students, parents, and educators all play important roles in the planning and implementation of a student s special education program. Recognizing everyone s contributions and setting observable, measurable, and realistic expectations for student achievement will lead to a positive school climate, the best possible education for the student, and minimal conflict. A detailed description of the roles and responsibilities of all parties collaborating in a student s education is provided in Appendix A. 7. Ontario Human Rights Code, 1990, s. 17 (2). 12 3 Understanding Conflict Conflict is natural. When it is a catalyst for needed change, it can have a positive outcome. Conflict usually starts when someone decides that current conditions are unacceptable and need to be changed. Only one person is needed to start a conflict; others may become involved whether they wish to or not in response to this initial impetus for change (Windle & Warren, 1999). 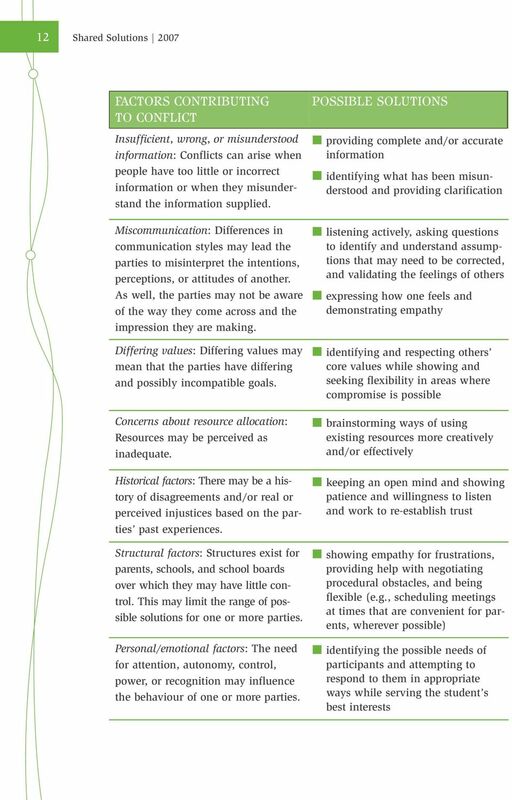 A clear understanding of conflict both in general and in special education contexts is crucial to achieving solutions that meet the needs of the student and that are acceptable to all those involved. 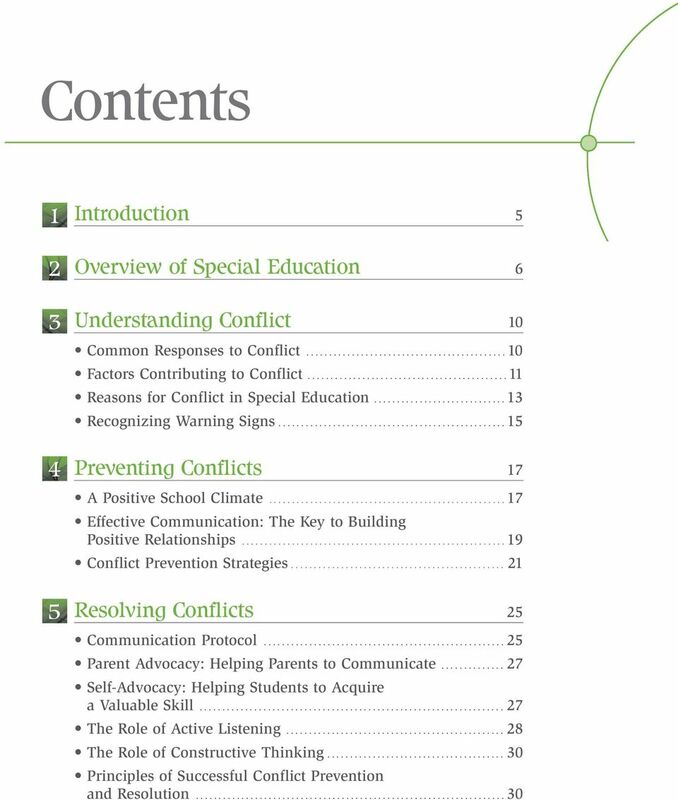 This chapter attempts to clarify the following aspects of conflict: common responses to conflict factors that contribute to conflict reasons for conflict in special education warning signs of potential conflict Common Responses to Conflict 8 In general, there are several common responses to conflict. These include avoidance, confrontation, and acquiescence. The strengths and drawbacks of these three specific types of response are outlined below. 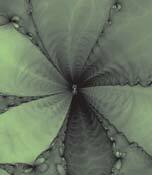 AVOIDANCE Avoidance can be useful when moods and emotions are high. Sometimes taking a break allows the parties to cool off, reflect, and consider trying a different, potentially more constructive approach to resolving the issue. In some cases, too, a person may judge that an attempt to deal with a particular conflict is likely to be counter-productive and may decide not to engage with it immediately. However, a consistent pattern of avoiding conflict and hoping it will go 8. 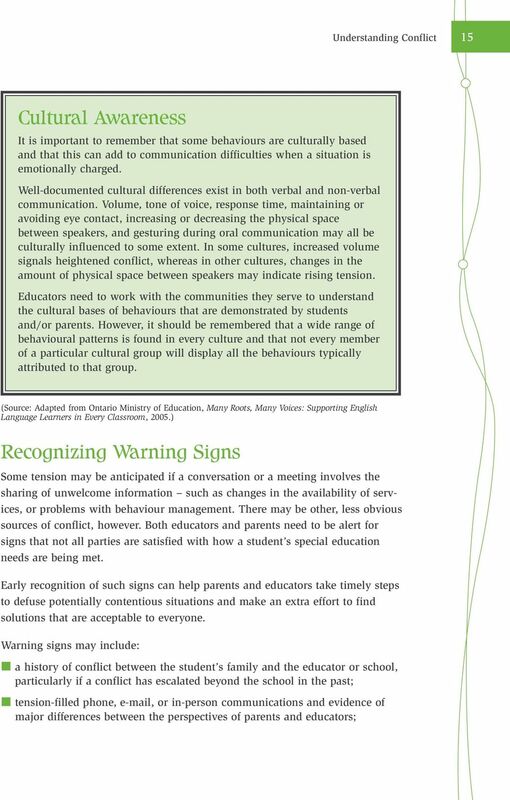 The information in this section is based on Windle and Warren, Collaborative Problem Solving and Dispute Resolution in Special Education, 1999. 13 Understanding Conflict 11 away may be a sign that a person has difficulty acknowledging that there is a problem or that there is merit in the other person s point of view. CONFRONTATION Confrontation involves acting on the belief that only one side is right or that there is only one perspective on an issue. While an adversarial response may be taken if a legal right is at the heart of the conflict, emotions can run high and relationships may suffer long-term damage. Confrontation also creates a win lose situation and may not serve the long-term interests of the parties. 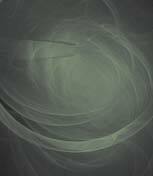 ACQUIESCENCE Acquiescence involves giving in to the other side. As with avoidance, this response may sometimes be appropriate. For example, if more will be lost through damaged relationships than through giving way, giving in may seem to be the most constructive response. However, if the party who gives in feels pressured or ill-used, resentment or a sense of grievance may follow and lead to difficulties at a later date. Each of these types of response has merit in some situations. Recognizing when one of these approaches is appropriate is an important skill. However, these responses are not the only possible options. By expanding their repertoire of conflict resolution strategies beyond these limited reactions, both parents and educators can significantly enhance their ability to achieve satisfactory solutions to conflict. 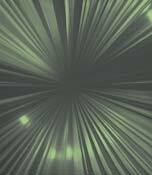 Suggestions for developing and enhancing collaborative conflict resolution skills and approaches are provided in Chapter 6 of this guide. Factors Contributing to Conflict A variety of factors can contribute, separately or in combination, to cause a conflict and/or to complicate or even prevent its resolution. It is important to note that conflict may be complex and that the real conflict may not be about the content but about the process used to resolve the conflict or the quality of the relationship of the people involved in the conflict. Analysing a conflict to determine what factors are involved can help identify steps that might lead to a solution. The chart that follows describes some of these factors and possible steps that can be taken to reduce their negative impact. 16 14 Shared Solutions 2007 scientific advances and about new types of interventions for children with disabilities is readily available from a variety of sources. In some cases, however, the interventions parents request may not be appropriate to a school setting or the particular circumstances of the individual student. Conflicts may arise during the development of the IEP about how the consultation should take place, about what is in the IEP, or about whether educators are listening and responding appropriately to the views of the student and parents. Conflicts may also arise if parents and/or educators are not fully informed about ministry regulations and policy documents with respect to regular and special education. As well, it is important for all parties educators, other professionals, students, and parents to be aware of their roles and responsibilities in the planning, implementation, and monitoring of special education programs and services. 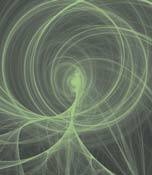 (These roles and responsibilities are outlined in Appendix A.) 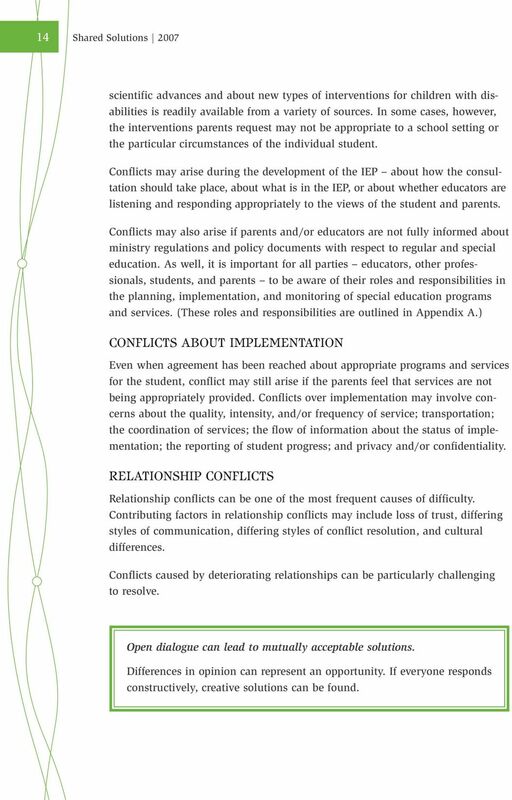 CONFLICTS ABOUT IMPLEMENTATION Even when agreement has been reached about appropriate programs and services for the student, conflict may still arise if the parents feel that services are not being appropriately provided. Conflicts over implementation may involve concerns about the quality, intensity, and/or frequency of service; transportation; the coordination of services; the flow of information about the status of implementation; the reporting of student progress; and privacy and/or confidentiality. RELATIONSHIP CONFLICTS Relationship conflicts can be one of the most frequent causes of difficulty. Contributing factors in relationship conflicts may include loss of trust, differing styles of communication, differing styles of conflict resolution, and cultural differences. Conflicts caused by deteriorating relationships can be particularly challenging to resolve. Open dialogue can lead to mutually acceptable solutions. Differences in opinion can represent an opportunity. If everyone responds constructively, creative solutions can be found. 18 16 Shared Solutions 2007 avoidance of phone, , or in-person communication by either parents or educators; questioning of the expertise and/or integrity of a parent or educator; a verbal attack by a parent or educator on another party; signs of defensiveness or anxiety in a parent, educator, or student, including: non-verbal signals, such as changes in eye contact, tightening of lips, narrowing of eyes, crossing of arms or legs, eye-rolling, rigid body posture, fidgeting, or doodling; verbal signals such as a rise in voice pitch, an increase in the rate of speech, sighs or other sounds of exasperation, repetition of statements, adversarial word choices; complaints about a meeting process or outcomes made to individuals who may or may not have been present at the meeting; repeated questions about how a program is being implemented; poor follow-through on agreements; a complaint filed by either a parent or an educator. 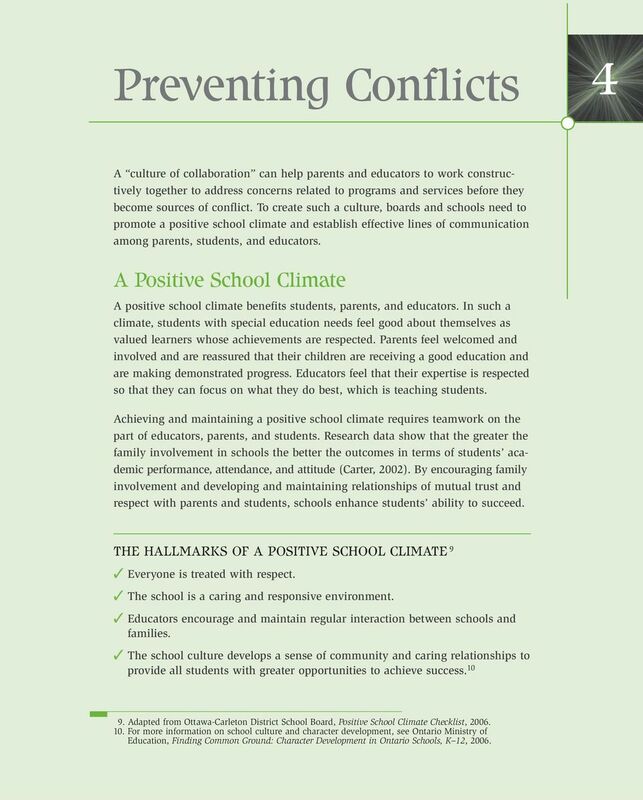 19 Preventing Conflicts 4 A culture of collaboration can help parents and educators to work constructively together to address concerns related to programs and services before they become sources of conflict. To create such a culture, boards and schools need to promote a positive school climate and establish effective lines of communication among parents, students, and educators. A Positive School Climate A positive school climate benefits students, parents, and educators. In such a climate, students with special education needs feel good about themselves as valued learners whose achievements are respected. Parents feel welcomed and involved and are reassured that their children are receiving a good education and are making demonstrated progress. Educators feel that their expertise is respected so that they can focus on what they do best, which is teaching students. Achieving and maintaining a positive school climate requires teamwork on the part of educators, parents, and students. Research data show that the greater the family involvement in schools the better the outcomes in terms of students academic performance, attendance, and attitude (Carter, 2002). By encouraging family involvement and developing and maintaining relationships of mutual trust and respect with parents and students, schools enhance students ability to succeed. THE HALLMARKS OF A POSITIVE SCHOOL CLIMATE 9 Everyone is treated with respect. The school is a caring and responsive environment. Educators encourage and maintain regular interaction between schools and families. The school culture develops a sense of community and caring relationships to provide all students with greater opportunities to achieve success Adapted from Ottawa-Carleton District School Board, Positive School Climate Checklist, For more information on school culture and character development, see Ontario Ministry of Education, Finding Common Ground: Character Development in Ontario Schools, K 12, 2006. 20 18 Shared Solutions 2007 Parents are involved in school activities. Everyone feels safe and secure. There is a strong focus on prevention and early intervention in conflicts. Everyone is invited to contribute ideas and offer feedback. The successes of both students and staff are celebrated. Learning disruptions are minimized. Cross-cultural communication is valued. Educators have received training on antiracism and ethno-cultural equity and on avoiding ableism, 11 sexism, and homophobia. All students are challenged through high expectations to do their best. Students are encouraged to show leadership in creating a positive school climate. School administrators know who students are. School spirit is strong among both staff and students. School statistics show high levels of achievement and student growth over time. MAINTAINING A POSITIVE SCHOOL CLIMATE Students, parents, and educators can all contribute to maintaining a positive school climate. What Students Can Do: Students can contribute to a positive school climate by working hard, by demonstrating respect for all members of the school community, and by willingly participating in school events such as peer mentorship/ leadership, circle of friends, student councils, and other extracurricular activities. What Parents Can Do: Parents can contribute to a positive school climate by becoming involved in their child s education and the life of the school. This might include volunteering, as well as attending school functions and parentteacher meetings. By demonstrating an interest in their child s school, parents send the message that they value education, thereby encouraging their own and other children to do so as well For more information on ableism, see Thomas Hehir, New Directions in Special Education: Eliminating Ableism in Policy and Practice, For more information on inclusion of parents in the Ontario school system, see Ontario Ministry of Education, Parental Involvement: A Checklist, 2006. 21 Preventing Conflicts 19 What Educators Can Do: Educators can contribute to a positive school climate by maintaining regular and positive communication with parents and by keeping the best interests of students with special education needs in mind at all times, remembering that each student has different learning strengths and needs and a unique style of learning. Effective Communication: The Key to Building Positive Relationships Effective communication is the key to building relationships of mutual trust and cooperation. Although educators and parents share the same goal to provide the best possible educational opportunity for the student each views the student s educational needs from a different perspective. Effective communication can help each party to understand and acknowledge the perspective and contributions of the other. THE PARENTS PERSPECTIVE It is important for all those involved in the education of students with special education needs to consider the pressures that can arise for families in adapting to the needs of their child. For some parents, the acknowledgement and recognition of their child s special needs can be very traumatic, and it takes time for them to adapt to the feelings they are experiencing. These feelings can include denial, anxiety, and fear. Sometimes it can be difficult for parents to match the desires they have for their child s future with their child s special education needs. Understanding the experiences that parents may go through with their children as they enter and progress in school can be invaluable in enabling educators to help the students and their parents make the most of their experiences. THE EDUCATOR S PERSPECTIVE Ontario s classrooms have changed to adapt to new technologies, new cultures, and students with a variety of needs and interests. Some students who have special needs require the intervention of a number of professionals and para-professionals, and this can create a challenge for the delivery of a special education program by the classroom teacher. It is important for parents to understand that educators must balance many interests in today s classrooms and must use their professional judgement daily to ensure that all students across Ontario receive an appropriate education. 22 20 Shared Solutions 2007 When all parties acknowledge and respect their potentially different perspectives, it is possible to arrive at a shared solution, including an enhanced positive school climate and better relationships. Boards and schools can promote effective communication between parents and educators by: ensuring that both parents and school staff receive common messaging about special education programs and services; providing training and professional development to help educators strengthen their communication skills including both their ability to present information clearly, tactfully, and with empathy, and their ability to interpret others messages and behaviours accurately and with insight and to understand how the other party is feeling; providing a school board communication guide, developed in consultation with the board s Special Education Advisory Committee (SEAC), to help parents know whom to talk to and when they should do so. Keeping the lines of communication open means that parents and teachers do not hesitate to contact one another about a student s progress whenever it seems advisable to do so. When people have a comfortable relationship, they are more willing to ask questions, offer opinions, and discuss options in an open and honest way, making it easier to avoid potential problems and to resolve difficulties promptly when they arise. Educators can check regularly for possible parent or student concerns or confusion by asking questions, and can clarify information if it appears that a communication breakdown has occurred. PARENTS AND EDUCATORS: THE SHARED PERSPECTIVE Disagreements may arise and strong emotions may surface when people discuss complex issues such as programs and services for students with special education needs. Knowing how to prevent conflicts from escalating and/or resolve them cooperatively helps maintain a climate where all students thrive. Where the parties already have a good relationship, they can air their concerns in a constructive way, exploring options and seeking creative, student-focused solutions to problems. 23 Preventing Conflicts 21 While both educators and parents are seeking solutions to address complex problems, it is important for all parties to balance strong advocacy of their own views with a commitment to inquiry a willingness to ask and respond to questions to clarify all parties understanding of the issues and positions under discussion. Inquiry and exploration enable participants to discover or disclose their own and others reasoning and assumptions and enhance each party s awareness and appreciation of other points of view. The use of an inquiry approach allows participants to avoid over-commitment to unrealistic positions, to build on one another s insights, and to work together to arrive at a shared solution. A positive school climate is based on and strengthened by effective communication. Effective communication provides a foundation for preventing and resolving conflicts in a friendly, informal way. See Appendix B for a list of tips and key questions that can serve as a quick reminder of the elements that can be used to arrive at a shared solution. A tearout sheet containing this information is provided at the end of this guide. Conflict Prevention Strategies Maintaining a positive school climate and keeping the lines of communication open can help to create an environment in which concerns can be resolved without conflict or with minimal conflict. 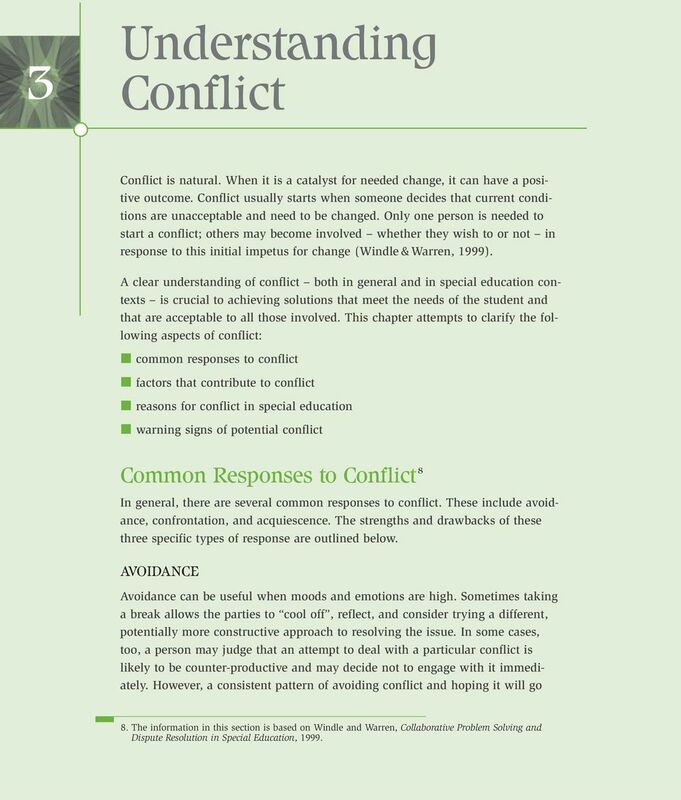 In addition, as discussed in Chapter 3, educators can be alert for warning signs and take steps to deal with possible triggers for conflict at an early stage. Scheduling a face-to-face meeting to discuss an issue can often be constructive. The strategies listed on pages can be used before, during, and after such a meeting to help participants work towards mutually acceptable solutions and avoid conflict. 25 Preventing Conflicts 23 invite questions and comments to clarify assumptions, perceptions, and information; seek clarification about the thoughts, feelings, and assumptions of others, paraphrasing if necessary to ensure that others views have been correctly interpreted; acknowledge key points made by others and ensure that they have fully understood another s position before responding; politely express disagreement about substantive matters if necessary, but avoid personal attacks and be prepared to intervene to prevent personal attacks by others; recognize the value of allowing people to vent their feelings, while keeping in mind that the meeting may need to be rescheduled if emotions can t be calmed; if emotions are out of hand and/or the meeting has reached an impasse, be prepared to stop the meeting and reconvene on another day; use paraphrase and exploratory questions to help less articulate participants express their concerns and feelings; ask questions such as How would this benefit the student? to keep the discussion focused on the student s interests; thank all parties for coming and provide them with the name of a contact person for follow-up questions and feedback, along with details of how this person can be reached. After a meeting, the note-taker should: prepare a summary of the meeting that clearly outlines: the key points discussed and any action items or decisions made; the next steps agreed upon; the date time, location, and purpose of any follow-up meeting scheduled; ensure that copies of the summary are sent to all those who attended the meeting. 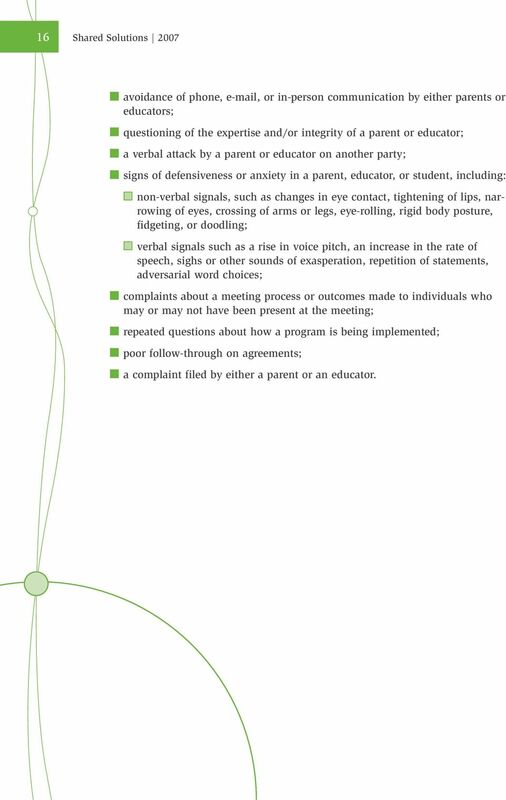 (Source: Adapted from Portland Public Schools, Guidelines for Conflict Management in Special Education, 2000.) The most important thing for everyone to remember is to keep the lines of communication open. That way, if at first you don t succeed, you can try again. 26 24 Shared Solutions 2007 Paul s Story: An Example of Prevention in Action Paul is a Grade 4 student recently diagnosed with a learning disability. An IEP with modified expectations was developed that took into consideration Paul s current level of reading competence. However, Paul was not doing his homework, and his teacher and parents became concerned. The principal organized a meeting with Paul, his parents, and the teacher to discuss the problem. Context, and actions taken: The school had well-established procedures in place for assessing students who were struggling with the curriculum and for consulting parents about the development of the IEP. The principal and teachers maintained regular ongoing communication with the parents. School personnel had been proactive in providing additional resources for Paul. The meeting identified a need to provide assistive technology for Paul and additional support at home as well. The meeting also identified a need for improved communication among the parties involved. Strategies used to prevent conflict: The student is included in discussions. The principal arranges a meeting with parents and relevant school personnel. Participants define the problem or concern. All parties discuss and explain the assumptions or beliefs that define the problem for them. Possible solutions are explored, with input from all parties. A daily communications book was provided outlining specific expectations for Paul to meet. The parents and Paul agreed to use the book to record completed work and give reasons for incomplete assignments. The school and parents developed positive reinforcement strategies to reward Paul for using the communications book and the new assistive technology. A follow-up meeting to review progress was scheduled for a month later. A plan is agreed on that identifies the roles and responsibilities of all parties in implementing the solution, with a time frame for carrying out the various steps. A follow-up meeting is arranged to review progress. 27 Resolving Conflicts 5 Communication Protocol When a conflict arises about a student s special education programs and services, it is essential that parents first speak to the person most involved in the student s education: the classroom teacher or the special education (resource) teacher. If the conflict cannot be resolved at this level, it may be necessary for the school principal to become involved. School board officials may also be called upon at this stage, as they bring an additional board-wide perspective to the issues in dispute. In some circumstances, when discussions with school board officials do not resolve the issue, staff of the regional office of the Ministry of Education may be able to provide information to parents, educators, and school board officials. They may also be able to share examples of successful strategies or solutions developed by other school boards. It should be noted, however, that ministry staff cannot provide legal advice or direction either to parents or to school boards, and those seeking legal assistance are advised to contact independent legal counsel. Various parent associations may be able to assist parents in their discussions with educators and school board officials. In addition, each school board s Special Education Advisory Committee (SEAC) has a mandate to make recommendations to the board about system-wide matters affecting the establishment, development, and delivery of special education programs and services within the board. However, SEACs do not advise parents or school boards on matters involving individual students. 29 Resolving Conflicts 27 Parent Advocacy: Helping Parents to Communicate All parents have the right to advocate for their child. Parents may wish to work with a parent advocate if they are unfamiliar with school board processes, or if their child s needs are complex, or if they feel that the intervention of a third party might be helpful. A parent advocate may accompany the parents to meetings to help them express their concerns. Parent advocates may be people with training in advocacy or may have some special education experience, possibly gained as an advocate for their own children. Parent advocates have a role to play in special education in Ontario; they can help improve communication between parents and educators and prevent or limit the scope of a potential conflict. Advocacy for a student with special education needs works best when the parent or parent advocate: has proven relationship/communication skills and/or an existing positive working relationship with educators; is familiar with how special education programs and services are designed and provided; is familiar with special education policy/legislation; is familiar with the school system in which the student is registered. Self-Advocacy: Helping Students to Acquire a Valuable Skill The ability to self-advocate is important for students to learn in order to be successful at all stages of their lives. Students live with their learning challenges on a daily basis and need the ability to negotiate obstacles, build on their strengths, and clearly articulate their needs. By cooperating to help students understand their strengths and needs and express their views, educators and parents can assist them to acquire important life skills. Schools are a great place for students to begin to develop and practise self-advocacy skills that they can use to learn and succeed throughout their lives. Students need to learn to take time regularly to reflect on what s going well for them, what isn t, and why, in order to communicate their strengths and needs to others. 30 28 Shared Solutions 2007 To be effective advocates for their own interests, students need an understanding of their legal rights and responsibilities. They also need self-knowledge an understanding of their strengths, needs, and personal goals. Self-evaluation and reflection are important components of self-knowledge. Before involving a student in a conflict resolution meeting, parents and educators should give consideration to the degree to which the student will benefit and be able to participate. The following questions might be useful: Does the student have: the ability to understand the procedures and content of the meeting (cognitive functioning)? the ability to behave appropriately during the meeting (behavioural functioning)? the ability to identify, express, and cope adequately with feelings in a meeting (emotional maturity)? specific needs (e.g., physical, language) that require accommodations at the meeting? The Role of Active Listening At any level of formality, successful conflict resolution depends on the ability of all parties to develop a clear understanding of the issues and of the concerns of the participants. Active listening is the key to understanding and plays a central role in all communication. 34 32 Shared Solutions 2007 BALANCING POWER Parents and educators have different responsibilities when it comes to educating students. For both parties to carry out their respective mandates effectively, each must acknowledge the role, responsibilities, and rights of the other. FAIRNESS Processes for resolving issues must be fair and equitable. All parties must feel that their own views and those of others have received a fair hearing and have been adequately taken into account in the outcome. TRANSPARENCY All communication should be open and all information freely available to all involved. 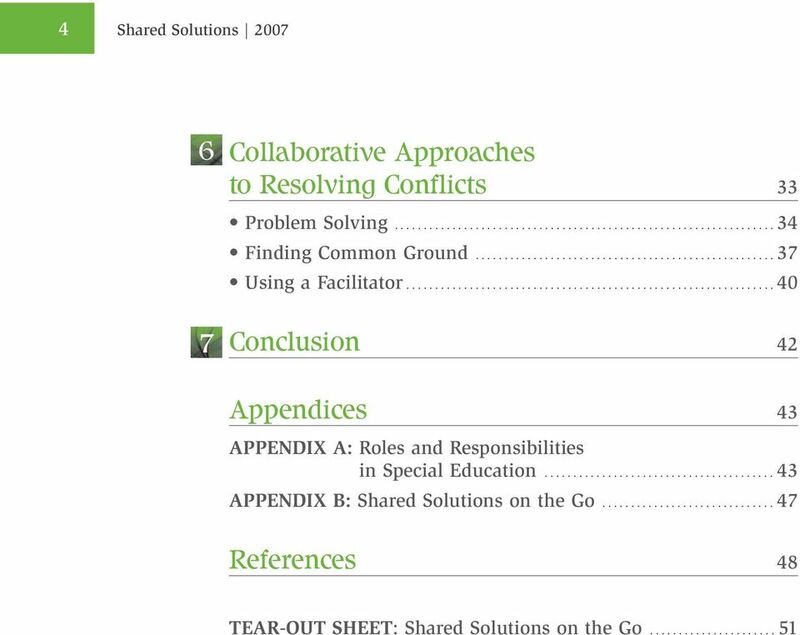 36 34 Shared Solutions 2007 Problem Solving Problem solving is the most informal of the three approaches to conflict resolution outlined in this guide and the one that gives parents, educators, and students the most influence over the outcome. It is important for everyone to keep an open mind during discussions and to be willing to consider creative solutions. Often, problem solving can be done with a phone call or a brief informal meeting, particularly when there is a positive school climate. For problem solving to be successful, each person must: agree on what the issue is; understand the assumptions and beliefs that underlie the issue; know what options (supports and resources) are available; come to the process without preconceived ideas about solutions; stay focused on the benefits for the student; be willing to share all information that relates to the issue; be open to others ideas and suggestions; use open and closed questions as a method of inquiry; be willing to explore creative ways of reaching a shared solution. 38 36 Shared Solutions 2007 Jovan s Story: Problem Solving Jovan is a Grade 9 student with behavioural challenges. Jovan s IEP had been quite successful in helping him meet these challenges in the past, but his English teacher noticed that he was becoming increasingly withdrawn from other students and was showing signs of anxiety. When approached about the problem by his English teacher, Jovan insisted that nothing was wrong. The teacher was not reassured. She approached the special education teacher, the principal, and the parents to discuss her concerns. Jovan s parents had also noticed that Jovan was withdrawing from daily activities and people. They had tried to talk to him, but he was unresponsive. Context, and actions taken: The student was included in all discussions but remained uncommunicative. The teacher made several phone calls to Jovan s parents before reaching his father. The parents work schedules meant that they could not be available during school hours for a meeting. The teacher and principal agreed to meet the parents and Jovan outside regular school hours. The teacher encouraged Jovan to invite to the meeting someone he trusted who would support him and act as his advocate, if necessary. Strategies used to resolve the conflict: The student is actively involved in the problem-solving process and is encouraged to invite someone to advocate on his behalf. Teachers contact the parents to discuss their concerns about the student s behaviour. The principal and teachers explore options for arranging a meeting with the parents. Educators and the parents have an open dialogue about their concerns and possible solutions. The parents expressed appreciation for the educators support and openly shared their concerns. The principal offered to provide a list of community agencies that give free counselling support to youth and families who are experiencing similar types of difficulty. School personnel and the parents agreed upon a four-week plan of action to address Jovan s special education needs, including timelines for feedback on progress. The parents made contact with a community service provider who could accommodate their work schedules. All parties agree to work closely together to address the student s special education needs. 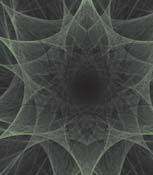 All parties discuss and explain the assumptions or beliefs that define the problem for them. A communication schedule is developed that accommodates the parents work schedules. A follow-up meeting is arranged to review the student s progress. 39 Collaborative Approaches to Resolving Conflicts 37 Finding Common Ground When everyone agrees that problem solving isn t working, it s time to try finding common ground. With this approach, a face-to-face meeting is always necessary, since part of the problem is that the parties have preconceived ideas about the solutions they want. This approach requires each party to: focus on the student s strengths and needs; discuss and explain the assumptions or beliefs that define the problem for him or her; have a clear understanding of what the issue is; clearly articulate how he or she sees the issue; share all information that pertains to the issue; listen actively and ask open-ended questions to elicit more information, such as What would happen if?, Would you be happy if? ; be willing to brainstorm to identify possible options; be willing to identify interests, perceptions, or needs that are common to the parties; be willing to compromise in order to narrow the scope of the issue; recognize and accept common ground when it is discovered; agree to a written plan to implement the agreed-upon solution; agree to attend a follow-up meeting within a set time frame to discuss how well the solution is working. 41 Collaborative Approaches to Resolving Conflicts 39 Ziyaad s Story: Finding Common Ground Ziyaad is a Grade 1 student with a language delay. Since the age of three, Ziyaad had been receiving speech and language services through the preschool program run by the local health agency. When he entered Grade 1, his mother expressed concerns about the level of speech and language services supplied by the school board. She had already talked to the teacher about her concerns, and Ziyaad was still not getting the services. Context, and actions taken: The student s mother contacted the principal to inquire about the level and frequency of speech and language services. The principal contacted the speech and language pathologist assigned to the school to get further information, which he conveyed to the mother. The mother continued to have concerns about the level of service and asked to meet with the teacher, the principal, and the speech and language pathologist. The principal set up the meeting. At the meeting the mother shared her concerns about Ziyaad s language skills at school and at home, and insisted on a certain type and frequency of speech and language services. School personnel (including the speech and language pathologist) explained the delivery of speech and language services within the context of the school board. Strategies used to resolve the conflict: The mother reaches out to the school to explain Ziyaad s needs and request specific speech and language interventions. The school gathers student information. All the parties at the meeting discuss the situation and are able to find common ground. After an open dialogue, the mother and school personnel found common issues and agreed on an action plan for speech and language services. An action plan was developed that included: a review of the most recent speech and language assessment; development of an IEP with alternative expectations related to Ziyaad s speech development needs; a speech and language reassessment (with the parent s consent) to help determine the type and frequency of speech and language services required; parental involvement through the use of speech-reinforcement strategies at home. A follow-up meeting was scheduled for one month later to review Ziyaad s progress and identify any further actions that might be required. By compromising within their specific interests, all the parties come to a mutually acceptable shared solution. Participants clarify the problem, agree on an action plan, and consult together to develop an IEP. A follow-up meeting is planned to review progress. 42 40 Shared Solutions 2007 Using a Facilitator At times it can be helpful to bring in a neutral third party a facilitator to help guide the resolution process. Potential facilitators may include educators or administrators not directly involved with the student s education; professional support staff such as special education coordinators, social workers, or other professionals; or someone from the community whom the parents and educators can agree on. For facilitation to be successful, the facilitator must be someone whom all parties trust. Both parents and educators may suggest potential facilitators, with the understanding that the person chosen must be acceptable to both parties. The facilitator s job is not to propose or impose solutions but to help participants identify the issue or issues, find common ground, and look for a mutually acceptable solution. A facilitator helps ensure that everyone stays on track by: making sure there is an agreed-upon agenda; keeping the discussion focused on the student s demonstrated strengths and needs and related program and service considerations; encouraging active participation by each party; identifying the issue and the purpose of the meeting; helping to clarify everyone s position, including using inquiry to identify any unwarranted assumptions or misconceptions and bring to light all relevant information; allowing respectful disagreements; intervening to limit interruptions and stop abusive behaviour; promoting the exploration of possible shared solutions that are realistic and attainable. 43 Collaborative Approaches to Resolving Conflicts 41 Brigitte s Story: Using a Facilitator Brigitte is a Grade 5 student. Brigitte had recently been assessed by a psychologist in private practice. Following the assessment, Brigitte s parents asked the school to recognize Brigitte as a gifted student and to provide an IEP with modified expectations that would better meet her needs. The principal requested a copy of the assessment, but the parents refused to share the information. The principal insisted that without a copy of the assessment he could not develop an IEP for Brigitte or refer her to an IPRC to be identified as a gifted student. The parents obtained a letter from the psychologist stating that Brigitte had scores in the superior range on the intelligence test. However, the parents did not want Brigitte to be formally identified as gifted, but to be provided with an enrichment program. The principal continued to maintain that he needed to see the assessment report in order to plan and develop the IEP. Tension increased between the school and the parents, with no resolution in sight. Context, and actions taken: The principal asked the parents to meet with the school board s psychologist to discuss the situation and to allow the school board s psychologist to communicate with the psychologist who had done the private assessment. The parents agreed and signed the required form allowing communication between the two psychologists. Strategies used to resolve the conflict: The parties recognize the need for an external facilitator with relevant expertise. The principal and the parents agree on a facilitator. The facilitator gathers pertinent information while respecting the parents wish for certain personal details to be held back. A member of school staff is selected to coordinate the meeting. A meeting agenda is prepared, and all staff directly involved in the student s program attend. The school board psychologist acted as facilitator at the meeting. School personnel and the parents came to an understanding at a second meeting about what could be shared from the private assessment report and what could be filed in the Ontario Student Record. An IEP was developed, with Brigitte s involvement. The facilitator considers the input from all the parties and helps them negotiate a solution. An action plan, including requirements for follow-up support and resources, is developed. Procedures for monitoring and tracking the student s progress are outlined, and a follow-up meeting to review results is scheduled. 44 7 Conclusion Delivering an education that is appropriate to the strengths and needs of students receiving special education programs and services is the goal of all partners in special education. The interests of these students are usually best served when conflicts are resolved promptly, without bad feelings, and with minimal stress for all parties. Conflict resolution approaches are useful and effective tools for achieving such a result. 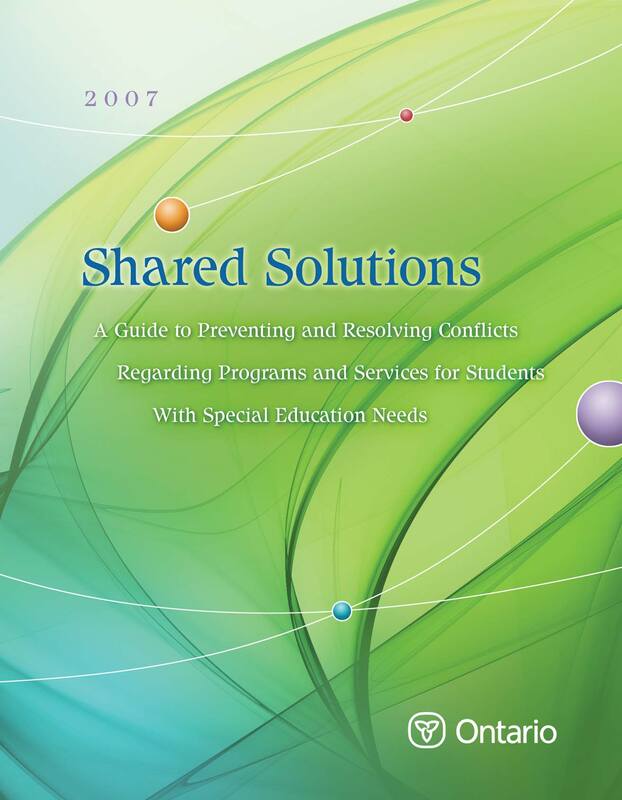 Learning to apply the conflict resolution approaches and strategies outlined in this document can help students, parents, and educators in special education to build bridges between schools and families. The goal, as always, is to create a caring, productive, and collaborative environment that enhances the learning experiences of students with special education needs and allows them to realize their true potential. It is important to remember that everyone brings different perspectives, values, and professional responsibilities, as well as different strengths, to the process of conflict resolution in special education. Parents have a wealth of knowledge and valuable information that can assist in the education of their children. Educators have training and experience and are guided by legal obligations and professional standards of practice and ethics. Through collaboration, students, parents, and educators can achieve the best outcome for students and in the process set a good example of how to prevent and resolve conflicts successfully. 45 Appendix A: Roles and Responsibilities in Special Education THE STUDENT The student: complies with the requirements as outlined in the Education Act, regulations, and policy documents, including policy/program memoranda; complies with board policies and procedures; participates in Identification, Placement, and Review Committees (IPRCs), parent-teacher conferences, and other activities, as appropriate. PARENTS Parents: familiarize themselves with board policies and procedures in areas that affect their child; participate in IPRCs, parent-teacher conferences, and other relevant school activities; participate in the planning of the student s Individual Education Plan (IEP); become acquainted with the school staff who work with the student; support the student at home; work with the school principal and teachers to solve problems; are responsible for the student s attendance at school. 48 46 Shared Solutions 2007 reviews the plan annually and submits amendments to the Minister of Education; provides statistical reports to the ministry as required; prepares a parent guide to provide parents with information about special education programs, services, and procedures; establishes one or more IPRCs to identify students with special education needs and determine appropriate placements for them; establishes a Special Education Advisory Committee; provides professional development to staff on special education. THE MINISTRY OF EDUCATION The Ministry of Education: sets out, through the Education Act, regulations, and policy documents, including policy/program memoranda, the legal obligations of school boards regarding the provision of special education programs and services; prescribes the categories and definitions of exceptionality; requires school boards to provide appropriate special education programs and services for their students with special education needs; establishes the funding for special education through the structure of the funding model; requires school boards to report on their expenditures for special education; sets province-wide standards for curriculum and for reporting achievement; requires school boards to maintain special education plans, review them annually, and submit amendments to the ministry; requires school boards to establish Special Education Advisory Committees; establishes the Ontario Special Education (English and French)Tribunals to hear disputes between parents and school boards regarding the identification and placement of exceptional pupils; establishes a Minister s Advisory Council on Special Education to advise the Minister of Education on matters related to special education programs and services; establishes a Provincial Parent Association Advisory Committee on Special Education Advisory Committees; operates Provincial and Demonstration Schools for students who are deaf, blind, or deaf-blind, or who have severe learning disabilities. 50 References Agree Dispute Resolution. (2007, June 13). Slide presentation on conflict resolution. Presented at the meeting of the Provincial Advisory Committee on Dispute Resolution Regarding Special Education Programs and Services, Toronto. Alberta Learning. (2003). The learning team: A handbook for parents of children with special needs. Retrieved August 27, 2007, from educationguide/spec-ed/partners/. Beyer, J.D., Feinberg, E., & Moses, P. (2002). Beyond mediation: Strategies for appropriate early dispute resolution in special education. Retrieved August 27, 2007, from Carter, S. (2002). The impact of parent/family involvement on student outcomes: An annotated bibliography of research from the past decade. Eugene, OR: Consortium for Appropriate Dispute Resolution in Special Education. Retrieved August 27, 2007, from Hehir, Thomas. (2005). New directions in special education: Eliminating ableism in policy and practice. Cambridge, MA: Harvard Education Press. Learning Disabilities Association of London and Area. (n.d.). Problem solving approach. [Pamphlet]. London, ON: Author. Manitoba Education, Citizenship and Youth. (2004). Working together: A guide to positive problem solving for schools, families and communities. Retrieved August 27, 2007, from Ontario Human Rights Code. R.S.O. (1990). index.shtml. Ontario Ministry of Education. (2001). Individual Education Plans: Standards for development, program planning, and implementation. Toronto: Author. Available at Ontario Ministry of Education. (2001). Ontario schools: Code of conduct. Toronto: Author. Available at conduct/conduct01.pdf. 51 References 49 Ontario Ministry of Education. (2001). Special education: A guide for educators. Toronto: Author. Available at speced/guide.html. Ontario Ministry of Education. (2002). Transition planning: A resource guide. Toronto: Author. 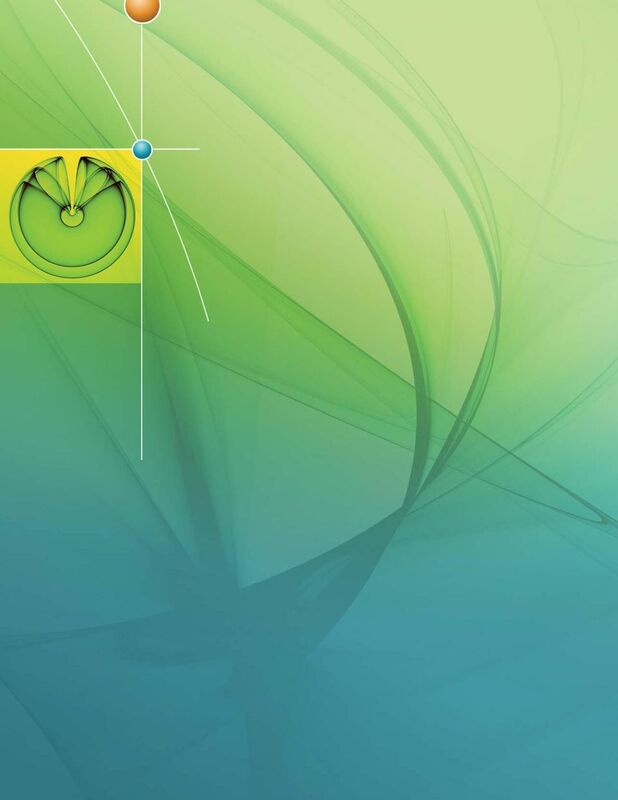 Available at transiti/transition.html. Ontario Ministry of Education. (2004). The Individual Education Plan (IEP): A resource guide. Toronto: Author. Available at elemsec/speced/guide/resource/index.html. Ontario Ministry of Education. (2005). Many roots, many voices: Supporting English language learners in every classroom. Toronto: Author. Available at Ontario Ministry of Education. (2005). Planning entry to school: A resource guide. Toronto: Author. Available at planningentry.html. Ontario Ministry of Education. (2006, October 12). Memorandum from the Deputy Minister of Education: Special education transformation initiatives. Available at Ontario Ministry of Education. (2006, November 30). Memorandum from the Deputy Minister of Education: Instructions for submission of school boards /school authorities 2007 special education plans. Available at Ontario Ministry of Education. (2006). Finding common ground: Character development in Ontario schools, K-12. Toronto: Author. Available at Ontario Ministry of Education. (2006) Parental involvement: A checklist. In Involving parents in the school: Tips for school councils. Published online, at Ontario Ministry of Education. (2006). Special education transformation: The report of the co-chairs with the recommendations of the working table on special education. Toronto: Author. 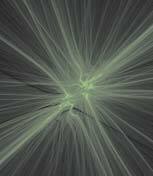 Available at reports/speced/transformation/. 53 Tear-Out Sheet Shared Solutions on the Go TIPS FOR REACHING A SHARED SOLUTION 1. Listen actively and intently. 2. Acknowledge the other party s position. 3. Acknowledge the validity of the other party s feelings. 4. Apologize if it seems appropriate to do so. 5. Use humour. 6. Change the timing of a meeting or take a break. 7. Use Yes and instead of Yes but. 8. Ask questions that elicit a yes response. 9. Change language from you to us. 10. Agree on a shared, mutually acceptable solution. KEY QUESTIONS TO HELP INVOLVE THE STUDENT 1. What is the problem? 2. Who is involved in the problem? 3. Who needs to be involved in the problem? 4. How do you feel about the problem? 5. What do you think can be done to resolve the problem? 6. What part could you play in resolving the problem? 7. How will we know if the problem has been resolved? 8. Who can you talk to if you need or want to share or clarify your thoughts and feelings about the problem? (Source: Adapted from Windle and Warren, Collaborative Problem Solving and Dispute Resolution in Special Education, 1999.) 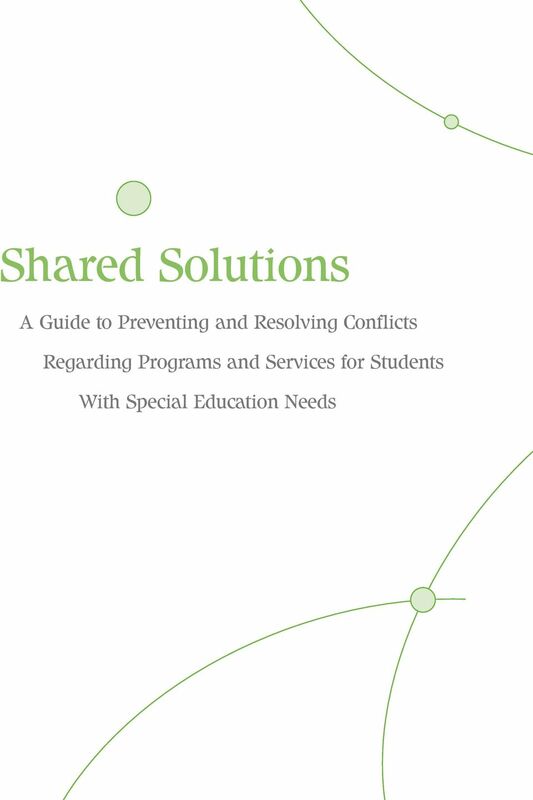 Reprinted from Ontario Ministry of Education, Shared Solutions: A Guide to Preventing and Resolving Conflicts Regarding Programs and Services for Students With Special Education Needs. Queen s Printer for Ontario, 2007. 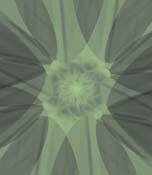 54 The Ministry of Education wishes to acknowledge the contributions of the many individuals, groups, and organizations that participated in the development and refinement of this resource guide. Let son/daughter take risks to become independent. Present son/daughter with options and choices.